Ivory seizures hit "record levels"
Whether big or small, a snake is a snake." Kenyan media is reporting that the bodyguard of Deputy Chief Justice Philomena Mwilu has been rushed to a hospital in the capital, Nairobi, after being shot. The circumstances surrounding the shooting are unclear but reports say that Ms Mwilu was not in the car at the time of the attack. She was one of four Supreme Court judges who voted to annul President Uhuru Kenyatta's win in the August election. A journalist with Kenya's NTV station has tweeted. The Supreme Court is due to hear a case tomorrow, requesting the postponement of the presidential election re-run scheduled for Thursday. The World Health Organization says cancer is becoming a major killer in Africa, accounting for nearly 500,000 deaths a year - a death rate set to double by 2030. But does the disease get the public health priority it deserves? Fred Okuku, a Ugandan oncologist from the Cancer Institute at Mulago Hospital in the capital Kampala, told the BBC's Kim Chakanetsa about the type of cases he sees. In a move denounced as a bribe, Ugandan MPs have received a one-off payment of 29 million shillings ($8,000; £6,000) each for consulting their constituents on a bill seeking to scrap the presidential age limit, the Reuters news agency reports. The proposed bill seeks to remove the upper age limit of 75 and is seen as a way of removing constitutional barriers that would prevent President Yoweri Museveni, 73, from running for office gain in 2021. Parliamentary spokesman Chris Obore told Reuters that the one-off payment had been released to the legislators’ bank accounts this week. “It’s to help them to consult with their constituents on this bill,” he said. Opposition members have been leading a strident campaign against the controversial bill, which is being backed by MPs from the ruling National Resistance Movement. The two sides have clashed publicly, with a brawl breaking out in parliament last month. Ugandan MPs earn about $5,900 a month, including allowances for regular travel to their constituencies. Mr Obore said that the East African nation is spending about $3.5 million to facilitate consultations on the bill by 445 legislators, Reuters reports. The other time MPs were given a similar pay-off was in 2005, when each of them received $1300 to consult on a draft bill that removed a two-term presidential limit, allowing Mr Museveni to stand again. Tanzania's government has banned the opposition-linked Swhaili language newspaper, Tanzania Daima, for 90 days after accusing it of publishing false information. The ban also applied to the daily newspaper's online edition, government spokesman Abbas Hassan said. Tanzania Daima’s publication company, Free Media, is owned by Chadema opposition leader Freeman Mbowe. The government says the ban is because the paper published a false story, alleging that 67% of Tanzanians use anti-retroviral drugs. This is the fourth newspaper to be suspended in a space of four months. The first West Africa Aerospace and Aviation exhibition has started in Ghana's capital, Accra. The three-day exhibition is giving aircraft manufacturers, airlines and equipment suppliers an opportunity to showcase their products. The products on display range from miniature planes to aircraft equipment. According to the International Air Transport Association, Africa's air transport industry will be the fastest-growing in the world in the next 20 years. The growth will be propelled by a burgeoning middle class and an improvement in the economies of African states, it says. For now, the continent’s aviation industry is bedevilled with problems. Some airlines - including South African Airways - are in financial crisis while others have a poor safety records. But experts say things are improving, and some airlines are doing well. Zimbabwe's President Robert Mugabe created a new ministry two weeks ago to deal with cyber security. The ministry's full title is Cyber Security, Threat Detection and Mitigation. Zimbabweans reacted to the announcement in customary humour. A fake letter with the signature and letterhead of the newly appointed cyber minister - Patrick Chinamasa - instructed all WhatsApp group members to register with the ministry by November. The letter was signed "By The Cyber Powers Vested In Me". Mr Mugabe's administration has been uneasy about social media after pastor Evan Mawararire spearheaded the #ThisFlag movement last year. Using platforms like Twitter and Facebook it organised a stay-at-home demonstration, the biggest anti-government protest in a decade. President Mugabe's spokesperson, George Charamba, says Mr Mugabe came up with the idea of a new ministry to deal with an "emerging threat to the state... a threat founded on abuse and unlawful conduct". Zimbabweans jokingly refer to the newly appointed cyber security tsar as the "Minister of WhatsApp"Image caption: Zimbabweans jokingly refer to the newly appointed cyber security tsar as the "Minister of WhatsApp"
Once again all eyes are on Kenya’s Supreme Court, which carries the weight of the country’s democracy on its shoulders. Now it has to rule on whether that re-run should be stopped or postponed, less than 24 hours before the polling stations are due to open. The petitioners are asking the court to clarify its 2013 interpretation of the constitution – that if a candidate drops out, the whole months-long process should begin again, rather than simply holding a re-run. That’s the case opposition leader Raila Odinga’s lawyers cite in connection with his decision to boycott the poll. According to the constitution the vote must be held before 1 November, but if the chairman of the electoral commission says that “it’s difficult to guarantee a free, fair and credible election,” can the court allow the re-run to go ahead? How will it handle a potential constitutional crisis if the election is not held within the timeline? Wednesday has been unexpectedly declared a public holiday, but the Supreme Court says that won’t affect its business. Zimbabwe's President Robert Mugabe would not have accepted the role of World Health Organization (WHO) goodwill ambassador because his country was a "world-famed" tobacco producer, the state-owned Herald newspaper quotes the veteran leader's spokesman George Charamba as saying. Mr Mugabe had learned of the appointment through the news, and would have considered any formal request to serve as goodwill ambassador an "awkward one," Mr Charamba added. The WHO had a clear stance against tobacco, but Mr Mugabe would not have acted contrary to Zimbabwe's national interest by campaigning against growing and selling it because it was the nation's main foreign currency earner, he said. Mr Mugabe would not agree to Zimbabwe stopping tobacco production for as long as "there are people who avidly smoke it and demand it" and for as long as "there are more sinful liquids that the rest of the world manufacture and sell", including whisky and beer which account for more deaths than smoking, Mr Charamba was quoted as saying. WHO director-general Tedros Ghebreyesus - an Ethiopian who is the first African to hold the post - announced Mr Mugabe's appointment last week, saying he could could use the role "to influence his peers in his region" to tackle non-communicable diseases. But he reversed the appointment after widespread condemnation, including from the UK government and Canadian Prime Minister Justin Trudeau. Prominent Tanzanian gospel artist Christina Shusho has apologised for a Facebook post that upset opponents of Kenya's President Uhuru Kenyatta, Kenya's privately owned Star newspaper has reported. The singer posted a prayer on Saturday which asked God to "give your servant Uhuru Kenyatta wisdom and answer his prayers whenever his call". "Give him knowledge to lead the country and when he calls answer him," the prayer added. Supporters of opposition leader Raila Odinga criticised Ms Shusho for her perceived one-sided prayer. She ended up deleting the post. The singer told Star newspaper that she was sorry: "It was not my intention to hurt you guys. Again, I am sorry. I just want to say that I will continue praying for you. Let love lead." Mr Odinga has withdrawn from Thursday's presidential election re-run, saying it will be a sham. A Zimbabwean human rights lawyer has tweeted that the wall surrounding the offices of the World Health Organization (WHO) in the capital, Harare, has been cleaned of graffiti which said: "Thanx WHO. Don't do it again. We're watching". It comes after the WHO reversed its decision to appoint President Robert Mugabe as a goodwill ambassador following an outcry from Western governments, Zimbabwe's opposition and non-governmental organisations. A top official of Kenya's opposition National Super Alliance (Nasa) has disputed reports that its leader Raila Odinga has urged his supporters not to stage demonstrations on election day. Mr Odinga had told the BBC Newsday programme that he was urging his supporters to "stay away" from the election but added that they have a right to demonstrate peacefully. Last week, Reuters news agency quoted him as saying at a rally in the capital, Nairobi that "demonstrations will continue. October 26 will be the biggest demonstration of them all." Kenya’s Supreme Court will hold a last-minute hearing to decide whether or not the re-run of the country’s presidential election can go ahead this week. The court will hear an urgent petition from three voters on Wednesday to have the poll postponed - the day before the election is due to take place. There is ambiguity between electoral law, the constitution and how the courts have interpreted it. The main opposition candidate Raila Odinga has cited one such ruling as a reason for boycotting what he calls a “sham election". President Uhuru Kenyatta, who is seeking a second term, has said the ballot must go ahead. He has a controversial electoral reform bill sitting on his desk ready to sign into law. Suspected pirates have kidnapped six crew members from a German-owned container ship off the coast of southern Nigeria, maritime site SeaGuardian reports. It says that the ship was en route from Equatorial Guinea's port city of Malabo to Liberia's capital, Monrovia. The report says that at least eight pirates boarded the ship and kidnapped the crew, including the captain. it adds that the remaining 12 crew were unhurt and resumed sailing to Monrovia where the ship is expected to dock on Wednesday. The AFP news agency reports that the The Liberia-flagged vessel is owned by Germany's Peter Doehle Group. The shipping firm said it would not disclose the nationalities of those abducted "for security reasons", it says. 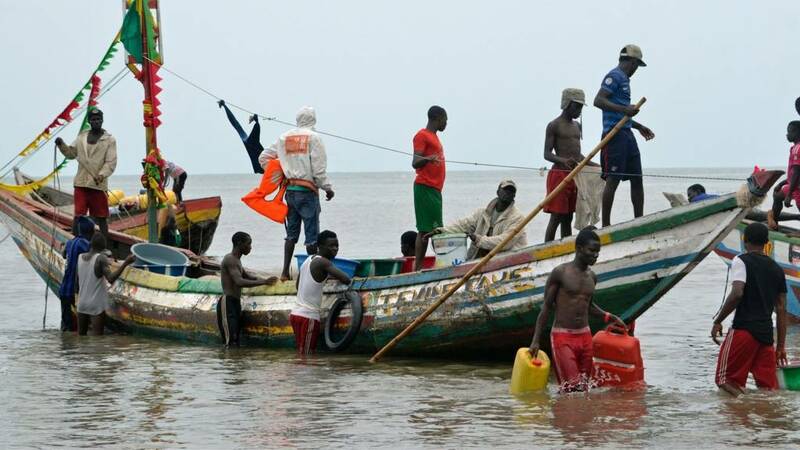 It described in a report published last week that the Gulf of Guinea remained a "hot spot for attacks", despite a fall in the number of incidents elsewhere in the world, AFP reports. A Ugandan MP has been fined by a court in the capital, Kampala, for causing a public nuisance by urinating in public after pictures of the incident were widely shared on social media, the New Vision news site reports. Abraham Abiriga was given a fine of 40,000 Ugandan shillings ( $10, £5) for the 25 September incident near the gate of the ministry of finance. He was prosecuted under a city ordinance which says that if any person is found guilty of "easing in the city" or committing a "public nuisance" will be fined 40,000 shillings or will be imprisoned for two months or will receive both punishments. Mr Abiriga was later confronted by a journalist about the incident. He defended himself, saying: "Can I keep on keeping urine in me". A woman in Somalia has held up a large truck at gunpoint, ordered the driver off and searched it for explosives. The vehicle was the same model as the one used in the recent massive truck bombing in the capital Mogadishu which killed more than 350 people. The woman, in the central town of Abudwak, said people were terrified when they saw the lorry approaching so she decided to make sure it was safe. A BBC correspondent in Somalia says many people have developed a fear of the model of truck used in the bombing. Read: Who were the victims of the bombing? Togolese striker Francis Kone has been honoured by Fifa for his life-saving actions in a Czech league match. He was given a Fair Play award at the Fifa "Best" ceremony in London on Monday night. Kone saved the life of goalkeeper Martin Berkovec back in February, after he nearly swallowed his tongue following a collision. Kone acted after Berkovec had clashed with his Bohemians 1905 team-mate Daniel Krch. He used his fingers to move Berkovec's tongue and stop him suffocating, after the player had been knocked out. "I can't stand there, watching someone suffocate, without doing something,"Kone told Fifa.com. Quote Message: The global collective effort that is under way is starting to reap positive results, but we are certainly not there yet." The global collective effort that is under way is starting to reap positive results, but we are certainly not there yet." Supporters of Kenya's main opposition leader Raila Odinga have taken to the street in the western city of Kisumu to protest against Thursday's presidential election re-run. They want the election to be postponed until their demands for changes to the electoral system are met. Mr Odinga has been rallying his supporters under the slogan "No reforms, No elections". Kenya's main opposition leader, Raila Odinga, has again called on his supporters to boycott Thursday's re-run of the presidential election, saying that it would be a sham. He told the BBC that the authorities had failed to reform the body which oversaw August's vote, which was annulled by the Supreme Court for illegalities and irregularities. Responding to a warning from Western diplomats that Kenyan politicians should stop engaging in dangerous behaviour, Mr Odinga said Kenya's problems could only be addressed by the Kenyan people. Speaking at a campaign rally yesterday, President Uhuru Kenyatta said there would be enough security and anyone who disrupted voting "will see what will happen to them".